Posted in Middle Eastern, recipe by Antonio Tahhan on December 3rd, 2008. You can follow any responses to this entry through the RSS 2.0 feed. You can leave a response, or trackback from your own site. Wow! That was very well explained Tony! The are very different to the Greek “dolmades” but I bet they’re just as delicious. No idea who the singer is! These are indeed very different from Turkish dolma! I will love to try your version! I have eaten similarly made stuffed grape leaves, but a vegetarian version.Very yummy! Oh wow! Those look awesome. I like the smaller size, too. Definitely saving this recipe. Beautifully presented post, as usual! There’s just too much time between each one! Tony, I’ve never seen this variation on dolmades but I do love the cigar shapes and the addition of chops in the pot. I love your photo demonstration of how to roll these – it makes the task look much less daunting. Is that Nancy Ajram in the background? I love her. My husband is Lebanese and I love your blog-the pictures so beautiful and very helpful. I need a recipe for Kaak or Ghrybe if you don’t mind…just kidding!! I shouldn’t read your blog when I’m hungry. It tortures me. Haha, I watch stuff on my Mac while cooking/baking, too! It’s the same in Italian families, too. They literally push food off on you whether you asked for it or not! Your recipe sounds really good. This is something I definitely need to try at least once, just because. Maybe next week you can make ya-pra-ques (as pronounced in the Maya/Hanono household) with cabbage! I have to admit that dolmas are not usually my favorite meze but these look very different and really good! you are my hero! i love these dolmas! they do seem like a lot of work but with Lebanese music I am sure it would go easier. My brother would know who that singer is as he totally is into the Lebanese music scene!! Tony – would you make me a batch while I watch the video. Please!! this is very similar to how we do it in our family, and sometimes we substitute the rice w/bulgur. i’ve watched my grandma, mom, aunts, etc make this over the years. the lebanese singer looks like najwa karam…? wowee…my mama makes them too, but i never dreamed of making them myself…but now, i just might ! Did you fall out of food heaven? OMG. Are you looking for a private chef gig? 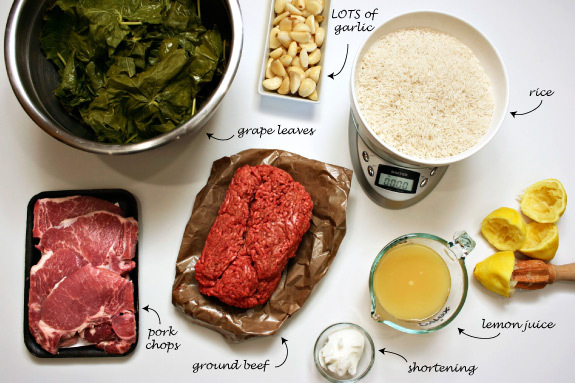 I have 1 question though… What’s the standard saiz of the leaves needed for this recipe? My grape tree on the balcony is growing well and I want to trim down a bit for more growth. Since the leaves varies, I want to make it standard for Dolmathes as well besides for this recipe. Thank you for sharing the Clock trick arrangement of the stuffed grape leaves in a round pot. I guessed a rectangular or oval pot could be easier. One more thing… for a guy, you sure have nimble fingers from now on 😀 Keep on rolling! 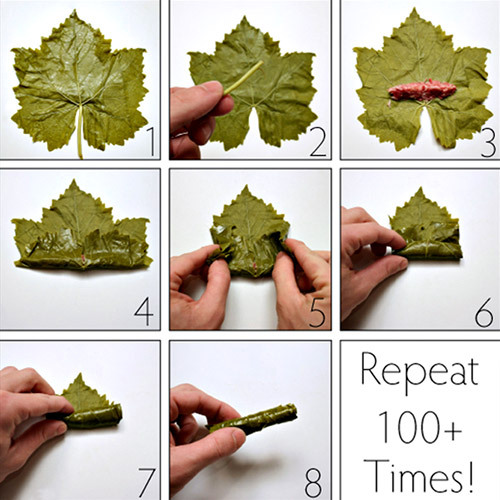 Your version of grape leaves are delish! Tony, I love the way you post your recipes…i like the way your site looks…so nice and clean,very neat! Your pictures are amazing!! so so clear. one thing i never do when i make stuffed grape leaves is i do not add garlic to the dish at all!! I am not sure if would like it with garlic! i would add plenty of garlic to the stuffed cabbage leaves for sure since the taste of the garlic and spices used in that dish are very complimentary. thank you always for sharing your detailed recipes with the world!!! Mrs. Ergül, let me know how they turn out! They are indeed different. Gracias querida Núria 🙂 I’m going to unveil the singer in my next post… and maybe link to one of her songs. Enjoy the recipe Kitt… you’re close on the singer, but it’s not Nancy Ajram. I guess they look a little alike from afar. Give it a try Peter 🙂 Let em know how they turn out. I would love to try to make the Greek ones sometime – do you have a good recipe I could follow? Thanks, Micha! The rolling isn’t as difficult as it seems… but it definitely takes time… lots of it. Jacqui, that isn’t Nancy Ajram… but I guess the mystery singer and Nancy do look a little similar. I will e-mail you my grandma’s recipe for ghrybe tonight… enjoy! Ay, Raquel… ya-pr-ques is la-kha-na 🙂 I will make some after I get back from Christmas break, I promise! You should give these little guys a second chance… so, so good! The Lebanese singer definitely made the whole process go by quicker. We should join forces and make a huge batch while watching an episode (err… I mean episodES) of House. Marianna, you’re AMAZING!! You’re the only person who got it correct – it is Najwa Karam! I’ve never tried making these with bulgur, but that sounds interesting… I will look into that. melfox, you should surprise her and try to make these one day!! Thanks, Pixen! I hope you found the info I e-mailed you to be useful! Thanks, habibi 🙂 hehe, I know you do! Hi Mai! Thanks for the info! I can’t wait to try this recipe with the machine! Thanks Summer!! I think the garlic is what gives the dish its amazing flavor!! I would say certainly give it a try with the garlic cloves and let me know what you think 🙂 I find the lemon-garlic combo to be an amazing pairing! After cooking they become soft and sweet. For the stuffed cabbage we use plenty of chopped garlic, too! I thought the Levant area in general (Syria, Lebanon, Palestine, Jordan) uses garlic for the stuffed grape leaves and the stuffed cabbage. Now I’m curious, so I’ll look into this some more. hey, i just read your mail- havent been checking emails in days! check your inbox soon! Hi Tony, I really got a kick out of reading your page here on how to make Yabraq (I’m guessing this to be the spelling thats goes with what my family (Syrian) always called it.) I can so relate to your story! When I saw mom soaking the leaves that she just picked from the yard, I would “try” and run but always got stuck helping with my 2 older sisters. Being the youngest by 6 years, I always got stuck pulling the stems off. Took years before I became a “roller”! Your #9 picture is the best! Thanks for the laugh of “truth”. Wow..These looking awesome. 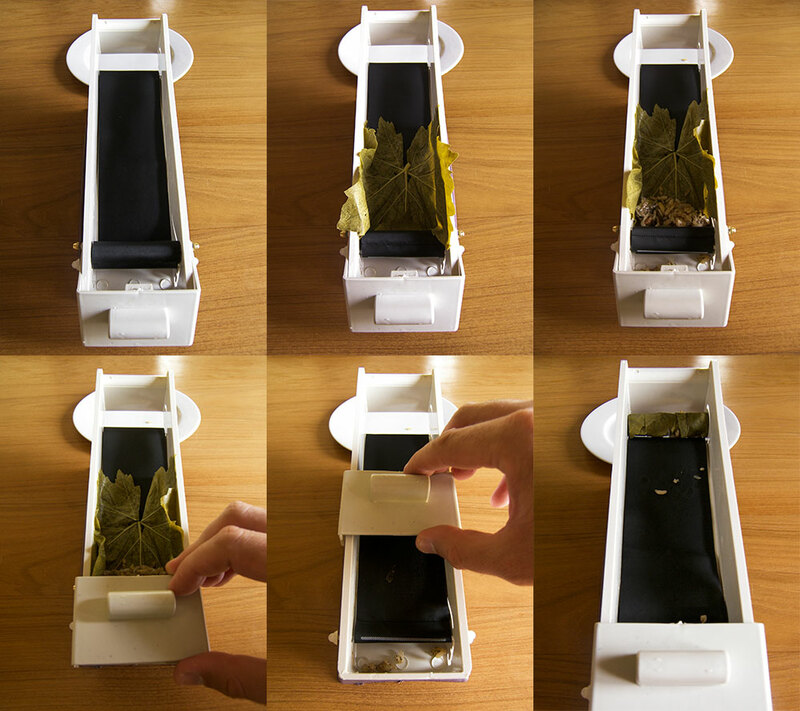 I love this item because of it’s interesting making process. Let me make. Great post! I love this website. It has the recipes for everything I crave to make. I especially love the Spanish flare! The singer is Najwa Karam! My husband and I made these last night. They turned out pretty good, but we used brown rice and the rice was still crunchy. We are going to try again with white rice and see if that makes a difference. Great mix of flavors. I also recommend adding fresh dill and/or mint to add to the great flavors inside the dolmas. I was trying to “pin” this on pinterest, but there isn’t an image that comes up to pin, other than “Tony Tahhan” up at the top. I want people to see that yabraq is NOT the same as dolmas. Because everyone tells me I’m wrong and that there is NO such thing. Oddly I’ve eaten it since almost birth, so I’m sure it’s real, ha ha. My Grandmother was taught how to make Yabraq years and years ago by an elderly lady that lived next door to her. We also make the yogurt and garlic sauce (with cucumbers)and have a flat pita bread. The recipes have now been passed on to 4 generations in our family. Thank you SO much for posting this. 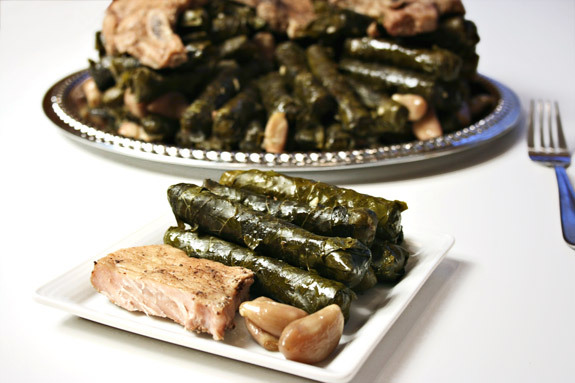 I noticed you mentioned using a plate to cover the stuffed grape leaves when cooking them. 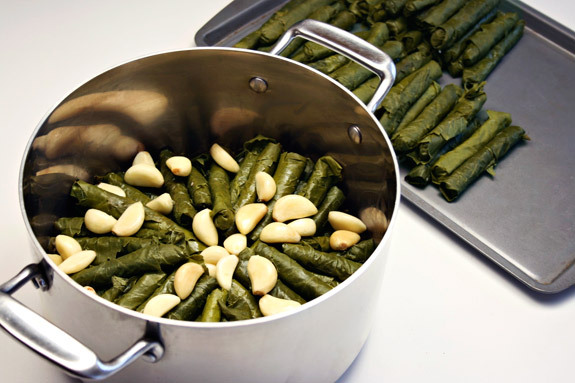 Have you ever used a Dolma Stone to hold your Dolmades together while they cook? I understand this old world kitchen device does a wonderful job of keeping the Dolmades from unraveling and actually helps cook them from the top down due to the heat the stone holds. The holes allow steam to escape and the handle makes it very easy to take out of the pot. I just made a vegetarian warag Enab, and I was googling a way for me to cook them with out burning anything. I came across your blog and I loved everything about it! great job sir. I loved the pictures.. it took me about 3 hours to make 150 mini ones. the singer is Najwa Karam?